Dakota cabs feature modern OEM styling with curved tubing front corner posts, easy door removal, external door locks, high impact ABS roof, acoustical headliner, curved front windshield, front windshield wiper, front & rear hinged windows, pre-wired for optional accessories. Cab is not ROPS certified, but fits over the existing, un-modified factory ROPS. 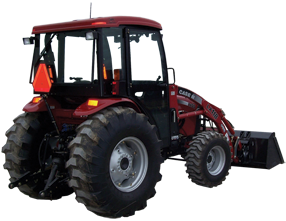 Special Fit-up Notes: This cab will fit bare tractors or tractors with a LX118 loader.